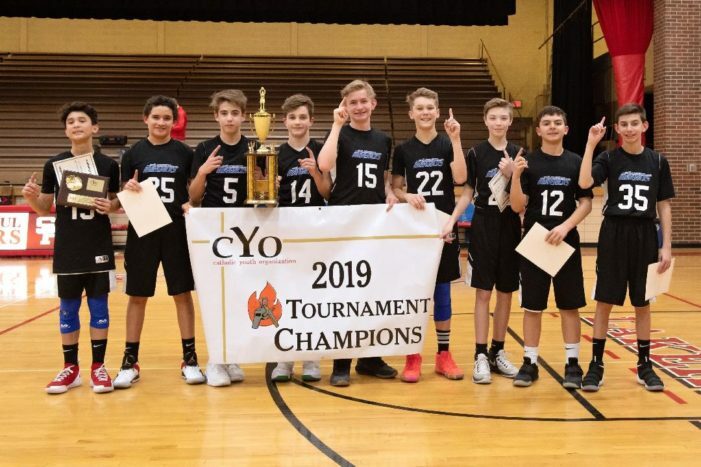 The St. Joseph boys 7th grade basketball team won the Detroit Catholic Youth Organization Tournament Championship on March 9 after defeating Novi’s St. Michael 50-24. This is the first time St. Joseph Catholic School has won a basketball championship in the schools 69 year history. Throughout the tournament the boys defeated St. Lawrence, St. Regis, Holy Family, U of D Jesuit, Holy Name and St. Michael to win the title. St. Joseph’s team was composed of boys from the school and the Parish — Caden Husch, Cass Feeney, Jacob Tuttle, Matthew Sadecki, Nolan Tompkins, Chase VanAmeyde, Brady Cinato, Chris Steffen and Kyle Stocker. Coach Tuttle is no stranger to coaching sports at St. Joseph. In the past 12 years he’s coached three other sports including volleyball and baseball. The assistant coaches are Ryan Husch and Brent Tompkins. Captains Jacob Tuttle and Caden Husch lead the team both on and off the court, encouraging everyone to try their hardest and give their all at practice. Some of the boys have been playing together for eight years now in various youth leagues and started playing with other Catholic schools in third and fourth grade. They won their division championship in fifth and sixth grade as well as several other tournaments in the past three years. All of this leading up to the CYO title. The team’s five starters were also recognized last year and the Michigan State Basketball camp run by Tom Izzo. Husch, VanAmeyde, Sadecki and Tempkins received honorable mention recognition for hustle, rebounding and improvement. Tuttle won the MSU camp MVP for his age group. And all five boys were selected to respected travel basketball teams this spring. Tuttle, Husch and Sadecki were selected to play on a national level for the Michigan Majors.